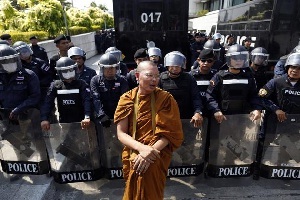 Bangkok, Thailand -- With anger and bitterness a common sight in these politically strained times, let’s pause and ask how we can still call ourselves Buddhists after allowing ourselves to sink this deep into the politics of hatred. Lest you forget, Makha Bucha Day is coming up this Friday. This year it also falls on Valentine's Day, which — in theory — should make the much-needed message of goodwill, love, and compassion it carries doubly louder. I doubt, however, that this will be the case. Personally, I find it perplexing and distressing to think that many will go to temples to make merit, light candles, and do the ceremonial circular walks around the prayer hall as pious Buddhists to observe Makha Bucha Day, then go straight to the rally sites or return home to watch their “blue” or “red” cable TV channels to enjoy the rhetoric of hatred without thinking much of it. Many love-birds, I guess, will also go to the rally sites together on Valentine's Day to express their larger love for the country as patriots, all the while feeling much closer in the same cause of destroying the enemy. Since both Makha Bucha and Valentine's Day have a common theme of love and compassion, we might as well ask ourselves what kind of love we subscribe to. Is it the kind that is blind and, when taken to extremes, can be destructive, personally and politically? All great teachers of every faith teach love for all without prejudice. They all teach deep listening, empathy, and forgiveness. Why do we then take delight in hate and dehumanising speech to legitimise our dark feelings and reaffirm our righteousness and superiority? Why do we celebrate our fierce love for certain political ideas or persons that lead to our passionate efforts to destroy the ideas or the persons we hate? Really, can we call this kind of motive love? I don’t have any answers. But if you look at what the Buddha taught on Makha Bucha Day 2,557 years ago, you might find yours. From childhood, we Thai Buddhists are taught that Buddha’s message from the “Ovada Patimokkha” sermon on the full moon day, nine months after his spiritual enlightenment is: "To abstain from all evil, to cultivate what is good and wholesome, and to purify one’s mind." The teaching is in line with the Buddha’s First Sermon on Asalaha Bucha Day on how to work one’s way toward inner peace through moral discipline, insight meditation, and the understanding of nature’s laws on impermanence and non-self to let go of greed, anger and delusion. Without this realisation, suffering will not end. It is not as simple as it sounds. As any practitioners know, this inner battle is the hardest one. Few Buddhists know, however, that the Buddha also gave other advice on Makha Bucha Day on how to obtain peace, without and within. Devote yourself to inner contemplation with patience and endurance, he advises. But also refrain from insulting and harming others, while cultivating restraint and modesty in one’s food and dwelling place. In short, peaceful speech, non-exploitation, and humility are also key Buddhist practices. The only goal of those practices, he said, is to end defilements and suffering. Nothing else. These teachings were originally aimed at monks who gathered to pay the Buddha respect on Makha Bucha Day. Look around and see for yourself if the clergy, the monks at political rallies, or those wealthy ones in palace-like temples follow the Buddha’s path or not. It is even less known among Buddhists that Makha Bucha Day also saw another important event in the history of Buddhism. In the last year of his life, this was the day on which the Buddha determined he would die. Three months later, on the full moon day of the 6th month in the lunar calendar, he did at the age of 80. The message was loud and clear: all things, all beings, all beliefs, are impermanent. All that comes into existence cannot escape decay, or death. Not the Buddha, nor any of us. So should we fight, hurt, kill and impoverish our mind and spirit for what will eventually come to pass, or something we will soon regret? And if our society is determined to go on this hateful path, should we still consider ourselves Buddhists? Sanitsuda Ekachai is editorial pages editor, Bangkok Post.